If I were to draw up a list of my all-time favorite iOS apps, Silvio Rizzi’s Reeder would be near the top. 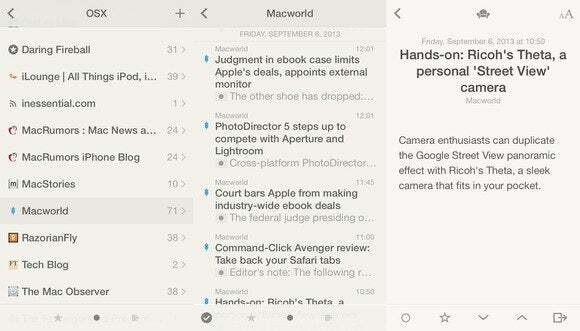 With an easy to use interface that embodied the user experience of Apple’s mobile operating system, Reeder made consuming large quantities of RSS feeds a daily pleasure. Like most of its competitors, however, Rizzi’s brainchild was heavily dependent on Google Reader’s unofficial API for its cross-device syncing capabilities—which means that, when the search giant decided to shut its RSS service down earlier this year, Reeder briefly turned into a highly-polished digital paperweight. Reeder for iPhone soon received updates that added support for several other RSS-sync services, such as Feedly, Feed Wrangler, Feedbin, and Fever, as well as the capability to manage individual feed subscriptions directly inside the app. Those changes, however, never made their way to the iPad version of the app, which was a separate product. Which brings me to the newly released Reeder 2 (App Store link), which combines support for all iOS devices into a single, new app. A $5 download that clocks in at a little over 7MB, Reeder 2 is universal, though the fact that the app requires iOS 6.1 or later means that owners of first-generation iPads won’t be able to install it. Reeder 2 supports the same sync services as its predecessor, which means that a future failure of any one player in this market is unlikely to cause a repeat of the same snafu that Google Reader’s demise brought us last July. Although updated to match iOS 7's visual paradigms, Reeder 2's interface is largely unchanged from its predecessor's. 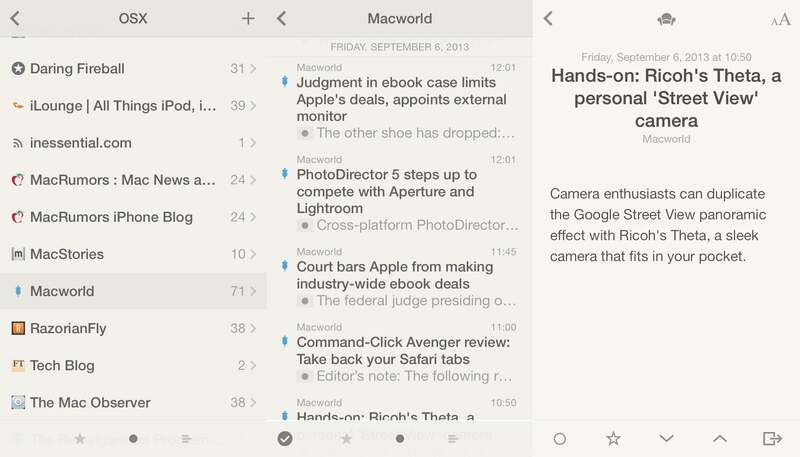 Like its predecessor, Reeder is a deceptively simple app. You sync your RSS subscriptions with a feed service, and then browse stories either by individual source or by making your way through a single list of unread items. The app conveniently caches story excerpts for you and displays them in an elegant format. You can filter your subscriptions so that they show only those articles that are unread, or only those articles that you’ve favorited. I was hoping that this major update would bring a search feature, but such an improvement is nowhere to be seen. In all fairness, search would probably be of interest mainly to a small subset of users who need to find stories across a large number of subscriptions. Being one of those users, I would warmly welcome the capability to find articles instead of just reading them. Another welcome new feature is that you can now add and remove subscriptions right within the app. 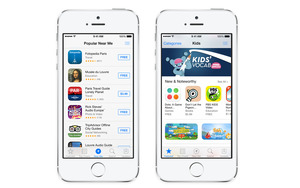 The most significant change in the app, however, is the adoption of a subtly different interface. Controls have been flattened, and the user interaction tweaked to better fit in with iOS 7’s new paradigms. In addition, a slew of new gestures have made their way into the user interface. For example, you can swipe from the edge of your device to navigate through the app’s various screens, or—a convenient addition—tap-hold an article in a feed to quickly mark all articles above or below it as read. The share panel is too small for big fingers and can’t fit most URLs. Still, Reeder 2 feels much like the original Reeder—and that’s not, in itself, a bad thing. After all, there’s a reason why the previous version of the app was so popular: It was simple and easy to use, and it made you feel in control of the news-reading process. Compared to the pseudo-curated-magazine layout adopted by many recent RSS readers (such as, for example, Feedly’s own iOS client), I think Reeder’s approach is far superior, if for no other reason than it actually follows proper iOS interface guidelines instead of trying to reinvent the user-interface wheel. If there’s a problem with Reeder 2, however, it’s that it focuses too much on superficial interface elements and not enough on user experience. Flatter icons, cool new gestures, and bouncy animations are great, but I would have preferred if the developer had invested a bit more on improving usability. For example, the old app had an easy-access button for refreshing feeds, and that button’s icon would rotate while subscriptions were being synchronized. The button has been replaced by a less-obvious pull-to-refresh gesture, and unless you’re on the main subscriptions screen, the only way to determine the status of the current sync operation is to repeat that gesture to “pull” the sync-status display into view. There are many other tiny issues like this one, and while none of them is a showstopper, they contribute to a general feeling that the app lacks the polish of its predecessor. Similarly, performance is also not as good as I would have expected: On my third-generation iPad, article lists don’t scroll very smoothly. Even on my iPhone 5, I saw the occasional hiccup. The suspense is killing me! Little omissions like this one pepper Reeder 2's interface, contributing to a general sense that the app is not as polished as its predecessor. Admittedly, much of what I don’t like about Reeder 2 comes down to nitpicking. Its predecessor set the bar extremely high, and the new app just doesn’t exhibit the same attention to detail. That said, Reeder 2 remains an excellent RSS reader that, at its core, is every bit as good as its predecessor—it has already regained its status as my RSS-feed reader of choice. And if the history of the original Reeder is any indication, many of these skin-deep deficiencies will be addressed in regular updates. If you happen to own the old version of Reeder, it may be a little hard to swallow paying for a new version that doesn’t provide much new functionality. But Reeder 2 gives you your daily news fix in an easy-to-use package that feels right at home on iOS 7. If you're an RSS junkie like me, Reeder 2—initial-release flaws and all—is easily worth another $5. Reeder 2 is every bit as good as its predecessor, and offers a number of nice interface tweaks, though the initial release needs a bit of polish.